One of Scotland’s most acclaimed comedians, Craig Ferguson first became known to American audiences as Nigel Wick, Drew Carey’s evil boss on The Drew Carey Show. He has now has won over the late-night television crowd as host of THE LATE LATE SHOW, after David Letterman on CBS. After several stints on the English comedy circuit, Ferguson brought his act to America in 1995 to star with Betty White and Marie Osmond in the short-lived ABC comedy “Maybe This Time.” After the show ended, ABC decided to add the talented Scotsman to “The Drew Carey Show, ” playing Drew Carey’s boss, Nigel Wick, from 1996-2003. Ferguson has written the feature films “The Big Tease” and “Saving Grace.” In 2003, Ferguson made his directorial debut with “I’ll Be There,” which he also wrote and starred in. “I’ll Be There” went on to receive the Audience Award for Best Film at the Aspen, Dallas, and Valencia film festivals. Craig was also named “Best New Director” at the Napa Valley Film Festival. Ferguson has also written his first novel, Between the Bridge and the River, which is set to be released this spring. In the book, two childhood friends from Scotland and two illegitimate half-brothers from the deep South suffer and enjoy all manner of bizarre adventures which, it turns out, are somehow interconnected, and even more surprisingly, meaningful. The eclectic cast of characters features Socrates, Carl Jung and Tony Randall, while love, greed, hope, revenge, organized religion and Hollywood also make special appearances. 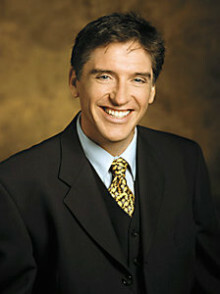 Ferguson, who took over as host of THE LATE LATE SHOW on January 3, 2005, is also one of its writers. After winning over the late-night television crowd, he also dipped his toe into the literary waters with a his debut novel, “Between the Bridge and the River.” It’s a comic story with an eclectic cast of characters, and it takes a dig at just about everyone. Ferguson’s act is “clean” and appropriate for corporate events. He will customize his presentation for each client. He is available for events close to Los Angeles during the taping of The Late Show, Monday through Thursday, and for any event Fridays, Saturdays and Sundays. Do you want to hire Craig Ferguson? Directly request a quote. In 48 hours we can send you the availability of Craig Ferguson If you would like to book Craig Ferguson, Entertainment Booking Agency is the right place. We will offer you the best price and contact the management or we directly contact Craig Ferguson. For corporate appearances or speaking engagements you can contact our agents and the will help you true the process. Tags: hire Craig Ferguson, Craig Ferguson booking, book Craig Ferguson, Craig Ferguson appearances, find more information on booking Craig Ferguson for appearances, Craig Ferguson speaking engagements, Craig Ferguson endorsements/spokesperson, Craig Ferguson appearance fees, Craig Ferguson booking agency contact info, biography of Craig Ferguson, Contact an artist booking talent agent find a speakers bureau that can book Craig Ferguson, speaker booking agency for Craig Ferguson, Craig Ferguson booking agency, Craig Ferguson booking for corporate event. EBA is one of the biggest entertainment booking agencies in the World. We book hundreds of celebrities, artist, athletes and speakers in a year. Important to know is that we are not claiming to be the management of Craig Ferguson. We are not the official agent for Craig Ferguson. Companies from around the globe book these artists and speakers true our company be course we have one of the biggest networks and we always have direct contact with the artist or the management. We help you to find the right celebrities for your corporate of private events. Please contact one of our agents to get free advice and we will help to get the world-famous artist on your party.